Trevon Jenifer has no legs as a result of being born with congenital amputation. Trevon broke and still holds the records in the 100, 200, 400 and 800 meter races for wheelchair track in the U11 and U14 age groups. He competed in wheelchair track and basketball until the age of 12 and then changed schools and competed in wrestling his junior and senior year in high school. His senior year he finished third in the Southern Maryland Athletic Conference with a record of 32-8. Trevon was inducted into the Wrestling Hall of Fame in 2006. Trevon attended Edinboro University of Pennsylvania where he earned his bachelor’s degree in Criminal Justice with a minor in Sociology. Trevon made his first Team USA appearance in 2009 when he was on the U23 Team that took gold in Junior World’s Championship. He then made the Men’s National Team in 2010 and has been a member since. He is a two-time U.S. Paralympian and won a bronze medal in the Paralympic Games London 2012 and gold medal in the Paralympic Games Rio 2016. In 2013-2015, Trevon played professional wheelchair basketball in the South of France. In October of 2015, Trevon became a proud father to a baby girl named Saraeya. Steve Serio is a wheelchair basketball player and New York native. Steve was paralyzed after undergoing surgery at 11 months old to have a spinal tumor removed and began playing wheelchair basketball at 15 years old. Steve led his high school to a national championship title and after high school, he played for the University of Illinois at Urbana Champaign. 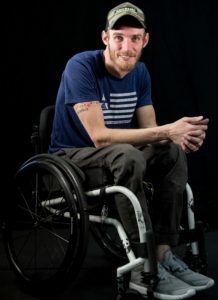 Steve is a three-time U.S. Paralympian, and two-time medalist, winning a bronze medal in the Paralympic Games London 2012 and gold medalist in the Paralympic Games Rio 2016. 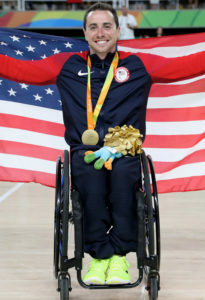 As a co-captain of the USA Men’s National Wheelchair Basketball Team, he led the American men to their first Paralympic gold medal since 1988 in Rio 2016. 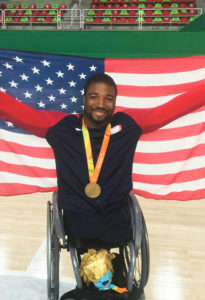 In 2017, Serio won the ESPY Award for Best Male Athlete with a Disability. 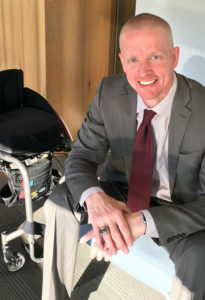 Will Waller is currently a Board Member of the National Wheelchair Basketball Association. He’s been involved in the sport for 25 years, becoming involved after being shot and sustaining a spinal cord injury growing up in Chicago in 1992, as a result of inner-city violence. 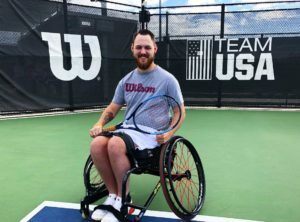 Will has had success on every level of the sport, including 2 Paralympic bronze medals, 2 World Championship gold medals and 1 World Championship bronze medal. He is an active board member focused on giving back to the sport, its current athletes and future members. The sport fueled a once dormant desire to succeed, which not only manifested itself on and off the court. In addition to his board role, Will is an executive recruiter and speaker in the areas of leadership, performance and culture. Prior to his current endeavors, Will was a human resource executive at Honeywell International, Whirlpool Corporation and The Goodyear Tire and Rubber Company. He is most well-known for his passionate approach to teamwork, driving change and taking on the toughest assignments. Will currently lives in Northeast Ohio with his wife, Kylie and their three children. Will is consistently trying to give back by mentoring at risk youth and people who are newly injured. My name is Ethan Thompson. I am 27 years old and living in Salisbury, Maryland. On July 5th, 2014 I suffered a C7 incomplete spinal cord injury from a diving incident. I spent two months at Magee Rehabilitation in Philadelphia for inpatient therapy and continued outpatient therapy at Kennedy Krieger Institute in Baltimore. After I completed therapy I decided to go back to school to pursue a degree in business. Before my injury I attended The Apprentice School in Newport News, Virginia. The apprenticeship taught me business skills as well as welding. I spent one year as a structural welder on the USS Gerald R. Ford nuclear aircraft carrier. I then began structural and pipe welding on several nuclear submarines such as the USS North Dakota, USS Minnesota, USS John Warner, USS Illinois, and USS Washington. It was a great honor to work on the vessels that our military uses to protect our country. I was recently able to complete my Associates Degree in Business and plan to pursue my Bachelors Degree with hopes to begin a new career path. I currently try to help contribute to spinal cord injury studies. I have been a volunteer at Magee Rehabilitation to provide knowledge on sensory regeneration. I currently attend sessions at Restorative Therapies in Baltimore, Maryland that help therapists learn how to use FES (functional electrical stimulation) on spinal cord injury patients. It’s very exciting to see how Falci Adaptive Motorsport is working with the disabled community. I have been a NASCAR fan my whole life. I grew up a Terry Labonte and Dale Earnhardt Jr. fan. I attended the Richmond NASCAR races twice a year for several years. The thought of being able to drive a race car on the track I’ve loved is a dream come true. Kevin Trimble served as an ARMY Specialist when he was in Afghanistan in 2011. On September 18, he and his unit were out on patrol sweeping a village for improvised explosive devises, when as he puts it, they found one the hard way. Trimble’s friend, Specialist Ryan Cook, stepped on an IED and was tragically killed immediately. At the time of the blast, Kevin was standing only feet away and it sent him flying as well. Kevin lost both legs and his left arm in the explosion. 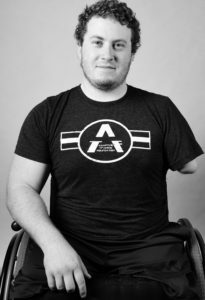 Kevin has been through Adaptive Training Foundations 9-week program and has overcome countless obstacles despite his injuries. Kevin works in IT with a data company and also gives back his time with other veteran organizations helping combat veteran suicide. In 2012 Will deployed to Afghanistan with the 82nd Airborne division. He worked vehicle recovery as a truck commander where he and his unit would go out to recover US Army vehicles and equipment that were hit by IEDs on patrol. On June 19, 2012, Will and his team had been on a 23 hour mission to run a crane out to a damaged vehicle when he and their convoy got hit by a daisy chain, a string of IED’s that detonate together. 3 trucks were all hit at once and the vehicle Will and his friend were driving had the entire front of the cab ripped off. As soon as the blast happened, Will knew his back was broken. They flew 40 feet away from the convoy in the cab where they finally crashed down. Thankfully Will’s friend was safe but Will now had to be ex-filled.The blast left will with a T3 break and many fractured vertebrae and ribs. 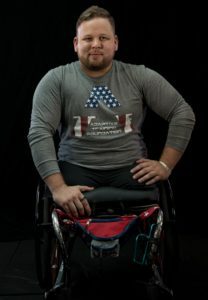 Will now offers his help to the Adaptive Training Program coaching other athletes like himself, and helping edit and produce a podcast between founder David Vobora and athletes that have been through or are going through ATF’s 9-week program. On September 5, 2008, Army E5 Sergeant Dan French was working under a vehicle when it slipped off its jacks falling on and pinning him, snapping his neck. Awake for the whole thing, an ambulance came and rushed him to the ER where he underwent testing for 8 hours without pain medicine. After coming in and out of consciousness, he woke up a few days later in ICU with a C4/C5 Incomplete Spinal Cord Injury. During inpatient rehab at the Shepherd Center in Atlanta, Georgia, Dan started feeling the pressure of touch in his lower body. 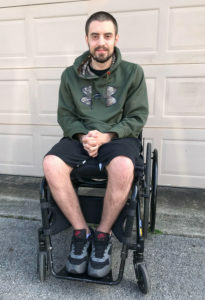 He always knew he would get function back despite being told that he had a 99 percent chance of never walking again, and after a nurse eventually asked him if he had ever tried to move his feet, his recovery began. He was able to pick up his left foot a few times and after years of rehab he slowly but surely progressed from a power wheelchair to a walker, to 2 arm crutches, to now walking often unassisted or with a cane. After a few setbacks throughout his training and what seemed like prolonged effort without visible progress, there came a point where he felt he could go no further on his own. A doctor at the VA told him about the Adaptive Training Foundation (ATF). Dan joined the ATF ReDefine class becoming an ATF athlete and once again redefining his life and pushing the limits of what is possible. He employs his never give up attitude every day in class as he continues to chase his own excellence. Born and raised in Springtown, TX, Lawrence joined the United States Army as a Wheeled Vehicle Mechanic in 2008. He was initially stationed in South Korea with 2nd Infantry Division and then moved to Fort Hood, TX with the First Cavalry Division. During this time, Lawrence was deployed to Iraq for about a year and was honorably discharged in 2012. As a civilian, Lawrence used his mechanic experience to become a Heavy Equipment Technician in DFW. On March 29, 2015, while riding his motorcycle, a reckless driver struck Lawrence head-on. Lawrence was thrown into the curb and then launched into a small tree and rolled down the street. Lawrence spent the next month in a medically induced coma during which he had 9 surgeries. One of them was to amputate both legs above his knees. He was on Dialysis and given a 3% chance of survival. When Lawrence woke up, his first question was “Where is my motorcycle?” Unfortunately, this was the least of his worries. He now had to come to terms with how he was going to live with no legs. This was difficult to digest but Lawrence was thankful to be alive. Knowing his faith in God, he knew he was given a new purpose. Lawrence spent the next 2 months in the hospital recovering and then was off to rehab to gain the strength he needed to return home. Once released, Lawrence had to figure out what exactly God’s plan was. That’s when a veteran friend gave him a phone number to call. The voice on the other end was the Adaptive Training Foundation. When Lawrence met with David for the first time, he was still very atrophied and had a wound vac on his left limb. David did not see someone broken or injured, he saw a man with motivation to take the path God had laid out. This was to become an inspiration to others and motivate them to become the best version of themselves. After participating in a few classes over a 2-year period of time, Lawrence became a volunteer trainer at the Adaptive Training Foundation. He really enjoys training and giving back to the amputee community. Lawrence is now pursuing his personal training certification to continue his love of fitness. The Adaptive Training Foundation has been a quintessential part of Lawrence’s fitness goals. This program allowed Lawrence to participate in Wheelchair Basketball, Powerlifting, Wheelchair Rugby, Mono-skiing, Adaptive Snowmobiling, and Para Ice Hockey. Lawrence fell in love with Para Ice Hockey so he joined the Dallas Stars Sled Hockey team. Lawrence’s speed and agility have significantly improved and he is looking forward to the upcoming season to start. Lawrence has set big goals for himself and hopes to make the Paralympic team in 2022. In the meantime, he will try out annually for the national team. My Name is Taylor Graham and I am 24 years old. I currently live in Lincoln, Ne where I have resided since the 4th grade. On August 29th, 2013 I was involved in a motorcycle accident which involved a van that had no working break lights. Upon topping a hill I noticed the van with no lights on. I didn’t have a visual on the stoplight and consequently assumed that the light was green and that traffic was starting to move, so I looked down to check my speed and looked back up. At this point it was already too late. With the van in the same spot it had been and a curb on my left, I checked right to see if I could ride in-between traffic but the cars were to close together for this to happen. Instantly I engaged both sets of breaks which caused the motorcycle to fishtail. After fishtailing three times the bike up righted and threw me into the air. I traveled 50 feet head first face down like superman and collided with the back of the van six inches below the back window and sustained all of my injuries. Although not the most life threatening of these injuries, the biggest one that impacted my life was a burst fracture to my C6 vertebrae. As a result of this injury I was left an incomplete quadriplegic using a manual wheelchair for most daily mobility. Since my accident I completed 3 months of inpatient therapy, and a little over 2 years of outpatient therapy full time. After completing therapy I went on to get my associates degree in Welding technology. I was the first chair user to complete the full program alongside my able-bodied counterparts. Around the same time I graduated I also had the pleasure of marrying the love of my life Hanna, and we also have two beautiful little girls. In my free time when I am not working, I am practicing and training for competitions in wheelchair tennis. I am on the national team, and also part of the High Performance Development Team through the United States tennis Association. I am currently ranked #34 in the world in the Quad Open Division. This Opportunity provided by Falci Adaptive Motorsports, and the Furniture Row team is something I have been looking forward to for quite some time. About a year ago after the first event was held and the new Instagram page was created, the connection was made between myself and the admins of this new account. Growing up My favorite driver was martin Truex Jr. back when he drove the #1 car for Bass Pro. To find out that my favorite driver now with the Furniture Row team in the 78 car, was paired up with an initiative like Falci Adaptive Motorsports was a little mind blowing. The fact that individuals like myself are getting the opportunity to get out on the track and ride in a real Nascar Championship Cup racecar, let alone drive one is something I already know I’ll never forget. This truly is bucket list material and I can’t wait to come down for this experience!